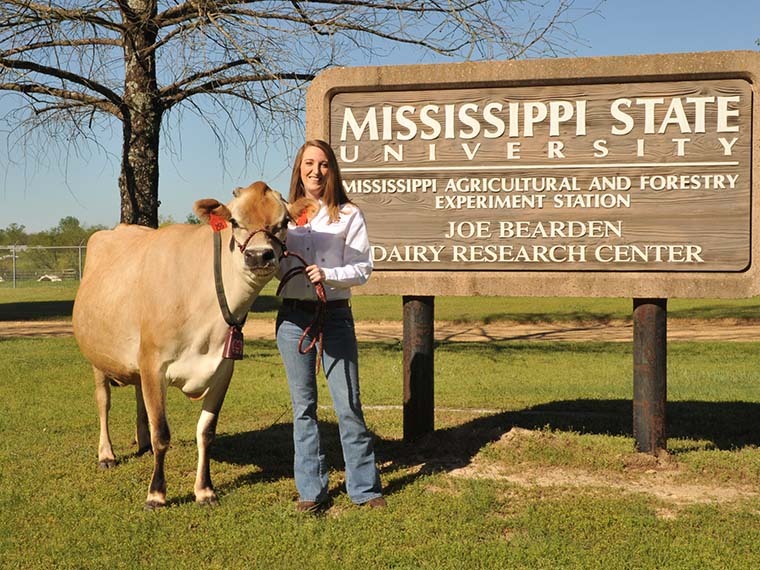 The Bearden Dairy Research Center, a unit of the Mississippi Agricultural and Forestry Experiment Station, is an award winning dairy farm that flourishes around production, research, teaching, and outreach. Mississippi Agricultural and Forestry Experiment Station partners with the MSU Extension Service as an important strategic partner at the MAFES Dairy. Dr. Amanda Stone is the MSU Extension Service’s state dairy specialist and an assistant professor in the Department of Animal and Dairy Sciences in the College of Agriculture and Life Sciences. Stone has worked with the MAFES Bearden Dairy Research Center from the beginning of her appointment at Mississippi State, three years ago. Several classes are held at the dairy to give students hands-on, experiential learning opportunities. “We use our cattle to teach future veterinarians, dairy scientists, and animal scientists about how to work with cows,” Stone said. The dairy has ongoing research that is aimed at benefitting Mississippi producers. “Our goal is always to conduct research that is directly applicable to Mississippi’s dairy producers—things that can be implemented by our producers to improve their herds,” Stone said. “We have a great herd for research and are growing it in order to have better statistical power for studies, but even more importantly, we have an amazing farm crew and graduate students that work hard to ensure our projects run smoothly” said Stone. Extension events are an important component at the MAFES dairy. “We have producers come out to learn what we are doing correctly, or sometimes not correctly, which is just as important,” Stone added. The MAFES dairy, in conjunction with the MSU Extension Service hosts a number of outreach events, such as Breakfast on the Farm. These events are aimed at fostering a passion for agriculture in children of all ages. As a working farm, The MAFES Bearden Dairy Research Center is first and foremost a production dairy. The MAFES Sales Store sells products made from the dairy farm’s most notable asset, milk. As dairy farms throughout the nation are closing, the Mississippi Agricultural and Forestry Experiment Station and the MSU Extension Service partner to conduct research and outreach to help Southern producers thrive. Teaching through the College of Agriculture and Life Sciences prepares the next generation of agricultural leaders.